(Click on the photo to enlarge and then the back arrow to return to original size). 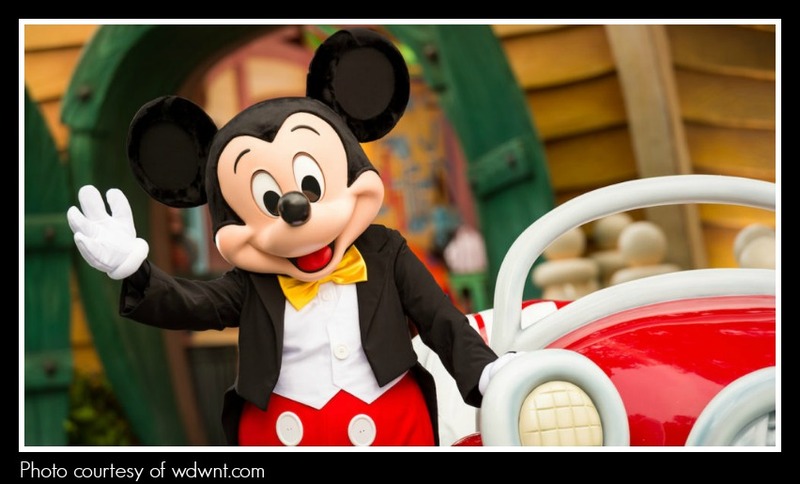 Hard to believe that Mickey Mouse has been entertaining young and old for the past 90 years since November 18, 1928. 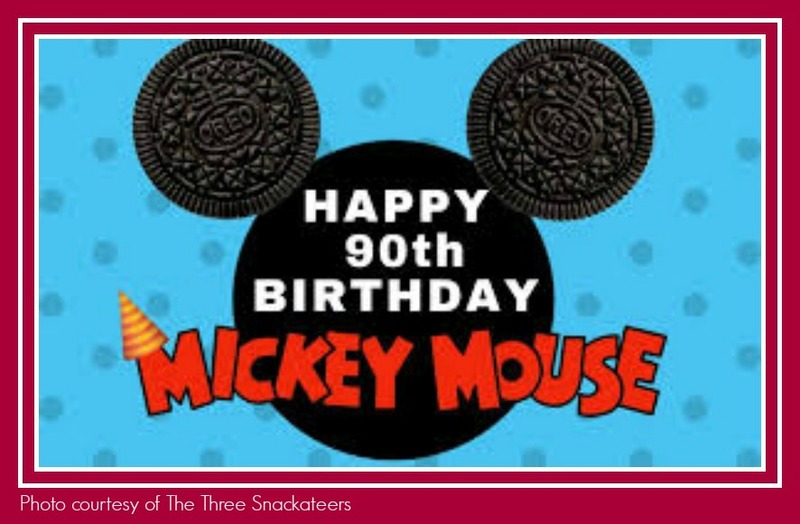 I saw Mickey’s 90th Birthday Oreo cookie promotion – “three 90th birthday designs on the top of the cookie and a birthday cake flavored filling” and it started me thinking, I should honor Mickey Mouse myself. After all, he brought so much happiness to my son during our Disney World visits. I know, every mother has made this cookie either for their child’s birthday or a cake sale at their elementary school, but it was easy and minimal ingredients so I had to make them. 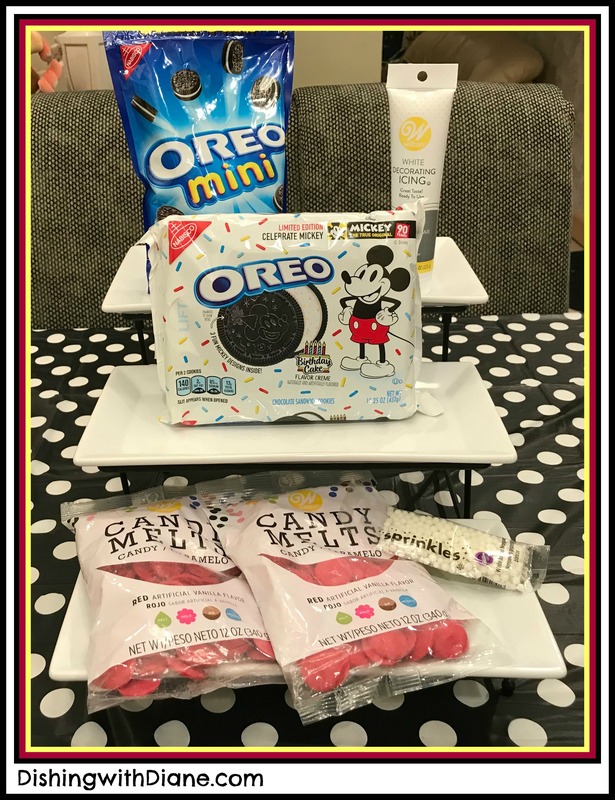 The ingredients are regular sized Oreo cookies (I just had to use the limited edition 90th Birthday cookies), mini Oreo cookies, a tube of white icing, red candy melts and white sprinkles. What can be easier than that? I started to open and remove the filling off of the mini Oreo cookies with a butter knife. 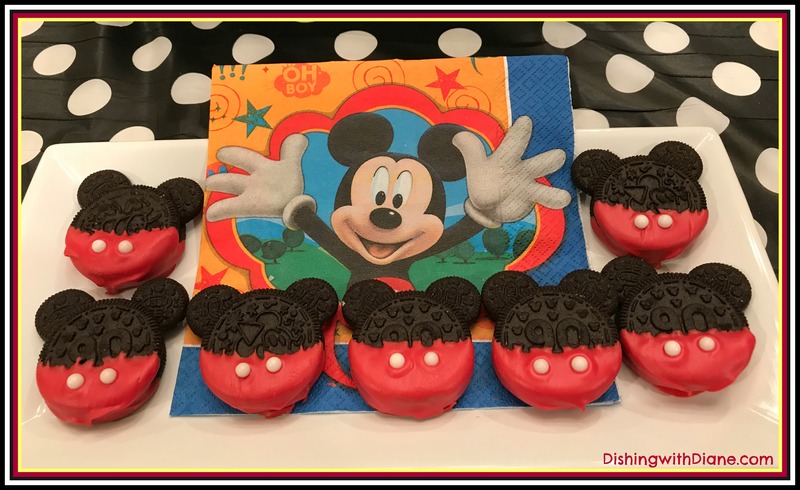 Next step, stick the mini Oreo inside the top of the regular sized Oreo as Mickey’s ears with a little white frosting as glue. Let it set up for a minute. I melted the red candy melts as per package directions and dipped half of the cookie in the melted red candy, a little shake to get excess candy off the cookie and place on wax paper lined cookie sheets. Before the candy melts set, add two round white sprinkles as buttons and you are done. Let the candy melts harden and set up completely. Ta-da, that is all there is to it. This cookie is great with a glass of milk, and I have the perfect drinking glass. 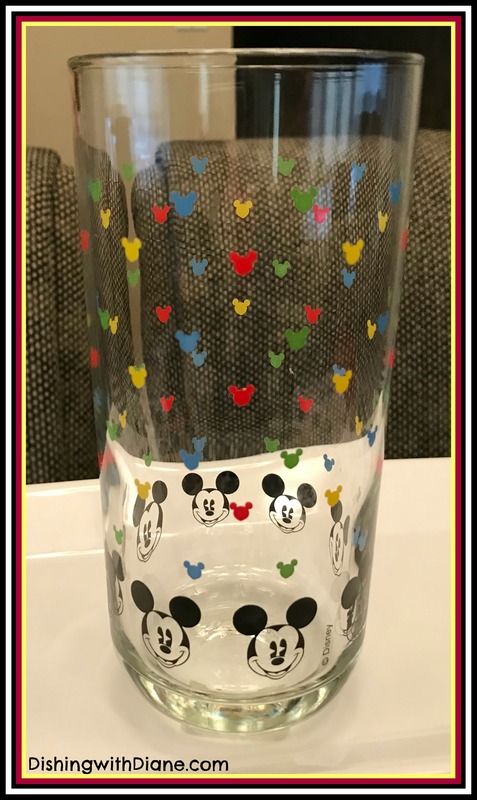 It’s my Mickey Mouse drinking glasses, that I bought back in the day at a Disney World souvenir shop. (I really wanted to buy the large turkey platter that looked like Mickey’s white gloves were holding the platter but it was too large to take on the plane). Anyway, my son made good use of these glasses. 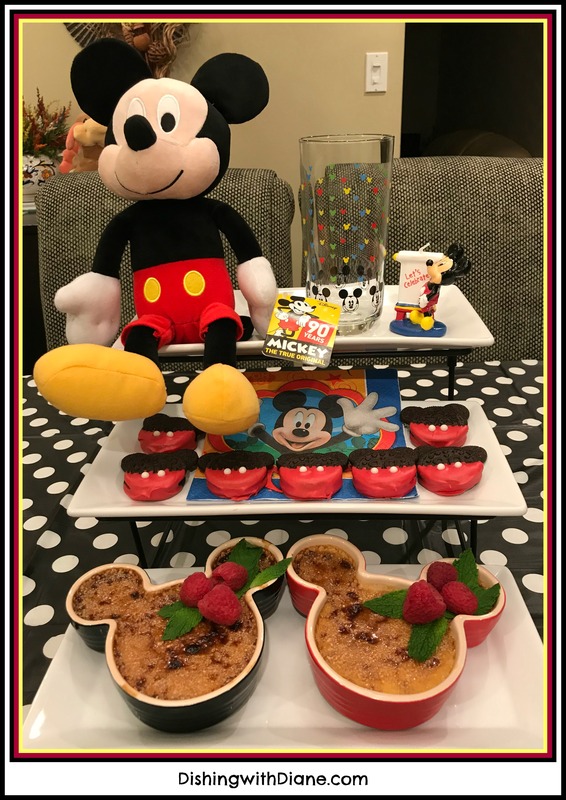 Now for more of an adult dessert, served in Mickey Mouse ramekins. I have used the ramekins for mac & cheese and today, it was a toss up between apple cobbler or creme brulee. 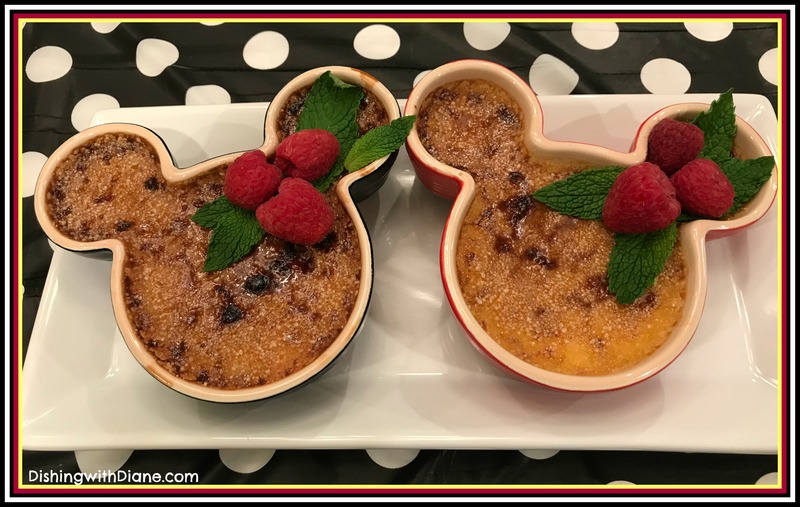 Apple cobbler was easy but creme brulee looks more elegant for a celebration. I had one problem, I didn’t have a kitchen torch to get the top of the creme brulee nice and caramelized. I know that you can use a hot spoon that you don’t want to keep anymore, so that wouldn’t work for me. So I searched for a recipe without a torch and I was lucky enough to find one (and it is fabulous)! I purchased all the ingredients and started the creme brulee process. 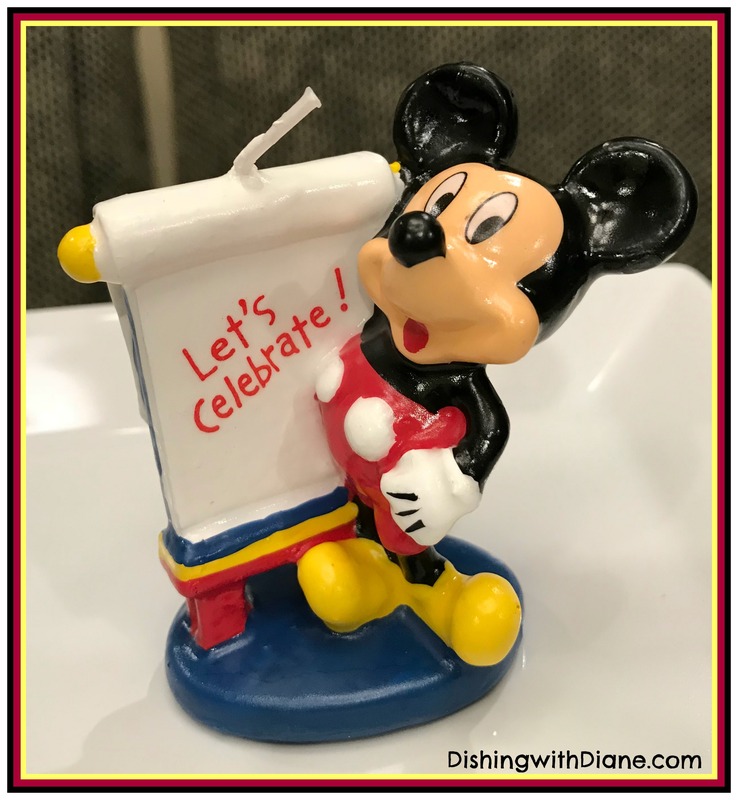 My Mickey tribute was not complete without a Mickey Mouse birthday candle. I found one in Michael’s Arts and Crafts. And finally, a guest appearance from Mickey Mouse himself. 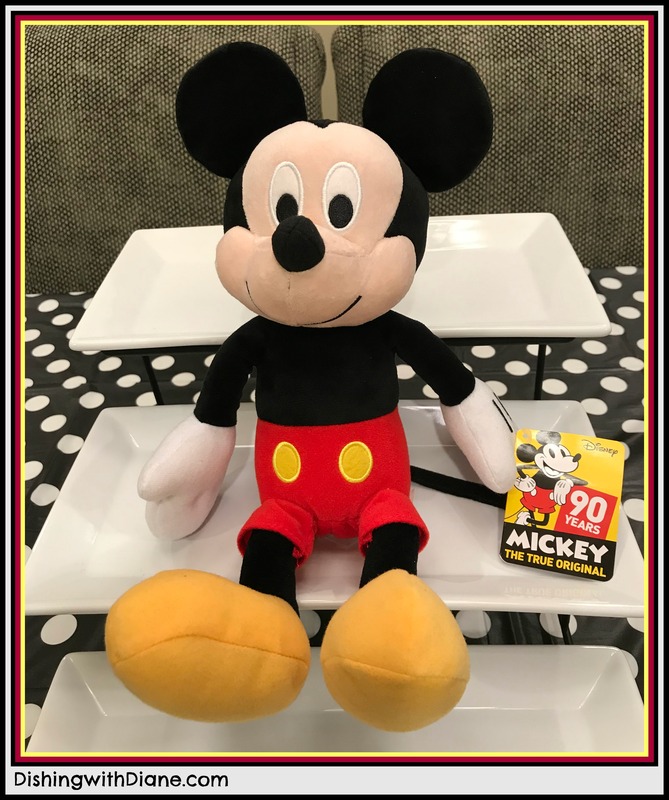 I purchased the 90th Birthday limited edition plush of Mickey Mouse just to have as a keepsake of this celebration. It took me back 25 years when my son was small & all our Disney World trips. Now my tribute is complete. Enjoy your day and Mickey’s birthday! Thank you for visiting my blog. 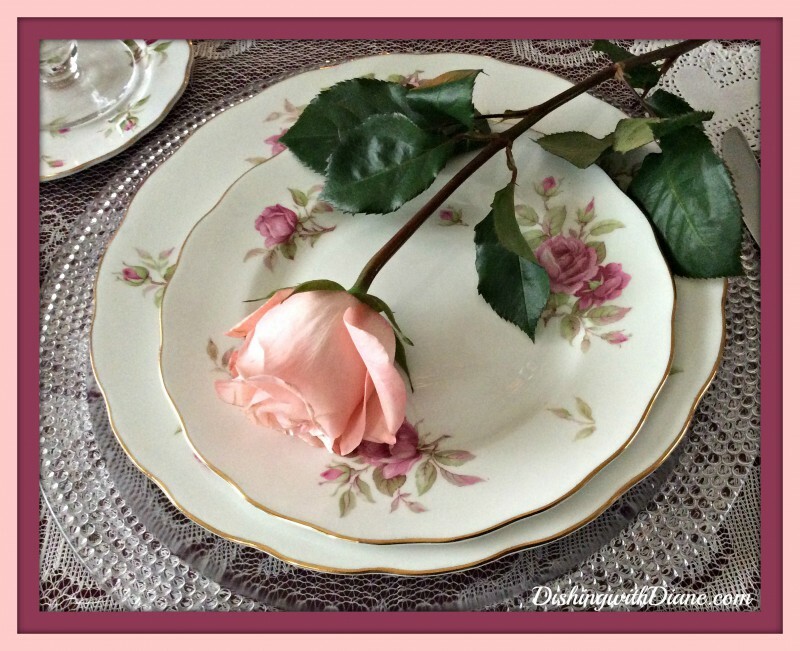 Ask your family and friends to join DishingwithDiane and become part of the family! Position a rack in the middle position of your oven. Preheat the oven to 325 F. Have your ramekins and a large casserole pan off to the side, at the ready. In a large bowl, whisk the egg yolks and 1/2 cup sugar. Whisk vigorously until the mixture becomes creamy, cohesive and lemony in color. Add the cream, vanilla and salt. Whisk until smooth and combined. Carefully divide the mixture between your four ramekins. It should fill them about 2/3 to 3/4 full. If your ramekins have bubbles on the sides, try your best to pop them with the side of a spoon. Pour about 1/3 inch of water in your baking pan. Place the ramekins in the water, so that the sides are submerged. The water should come about halfway up the ramekins. If the water level is too low, gently pour more water in the side of the pan, avoiding sloshing water into the ramekins. Place the baking pan with the ramekins in the preheated oven. Bake for 45 minutes to 1 hour, checking every 5 minutes after the 40-minute mark. The cook time can vary depending on the thickness of your ramekins. You’re looking for the custard to be mostly “set” with a little jiggle in the middle. Remove the pan from the oven, and gently remove the ramekins from the hot water by lifting with a spatula. Set on a wire rack to cool for about 10 minutes, then transfer to the refrigerator to cool for about an hour. You want the custard to be completely set before moving forward. Near the end of your cooling time, set the oven to the broil setting. Place the ramekins back on a baking dish (no need for a water both this time). Make sure that the tops of your custards are free of condensation (their naturally moist texture is fine, but you don’t want any beads of moisture). If needed, gently blot the tops with a clean paper towel. Sprinkle the remaining sugar over the tops of the custards. Place the baking pan in under the broiler for 3-5 minutes, monitoring closely, or until the sugar has melted into a satisfyingly crispy, browned crust. Enjoy your perfect crème brûlée! This entry was posted in Desserts on November 18, 2018 by aries041158. Great job as always………love seeing your posts….. Thank you Christine, I loved this post with Mickey. Try the creme brulee recipe- it is delicious. Everything looks so cute. The dipped Oreos look amazing! Thank you. Bob was my taste tester for the cookies. The creme brulee was fabulous. (now 26) to Disney World. Happy Thanksgiving! Thank you, my son is now 28 and I remember our trips to Disney as if they happened yesterday. Sweet memories. Have a very Happy Thanksgiving to you and your family.